No Problem. No special reason. I were not sure how to set the "import" functions of the header properly. So I chose "0.11" to leave space for an official version update. I just saw that with the new Qobuz script only highres files get downloaded. While this might be a great thing for some, for me this is actually quite annoying (since I have to convert them manually to 600x600). Is there a way so the user can decide which images get downloaded? It dies after about 400 albums saying that the album name/path is too long without telling me which one it is. 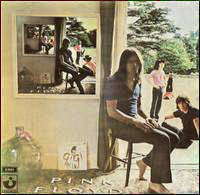 And it should not croak when this happens; it should just go to the next album! I need a bit more detail to go on. Did it pop open notepad with an error log? Was it in the File Browser? When searching for music? With ID3 tags or file path matching? I agree that it shouldn't crash out, but I need to be able to pin down exactly where the crash is occurring. It is a message in the bottom bar of the file browser as it scans my directory. For the last few weeks, I've seen frequent crashes. They're usually reproducible. (When I restart AAD and do the same thing, I get a crash once again.) I search for an artist/album. When I click on one of the sources (right column of the GUI), AAD crashes. Thanks for reporting this. I'm trying to reproduce it here, but no luck yet. As you can reproduce it reliably, could you check: Are you clicking on a source which is selected or unselected for searching? If it's selected, does it have any results? Are there results from that source currently visible in the search area, or would they have to be scrolled into view? Is it a specific source, or does it happen for any source you click on? Are you using any filtering or grouping settings? Thanks for reporting this. I'm trying to reproduce it here, but no luck yet. Thanks for looking into this! Here's an example which should answer some of your questions. As you can reproduce it reliably, could you check: Are you clicking on a source which is selected or unselected for searching? If it's selected, does it have any results? In the example above, yes. I just got the script to crash when clicking on the Discogs source. In that case, Discogs was selected for searching and there were results for it, too. Are there results from that source currently visible in the search area, or would they have to be scrolled into view? Is it a specific source, or does it happen for any source you click on? It seems at least GoogleImage and Discogs are affected. There may be more. From now on, I'll pay attention to what click causes a crash. I'll report back. Are you using any filtering or grouping settings? I have a filter by image size enabled (minimum 300 px). No grouping settings. OK, thanks, I *think* I have this pinned down now. Could you give the attached a try and see if it resolves it for you? Could you give the attached a try and see if it resolves it for you? It appears the new version indeed resolves the issue. No more crashes. Is there a way to put the album art inside each album folder? 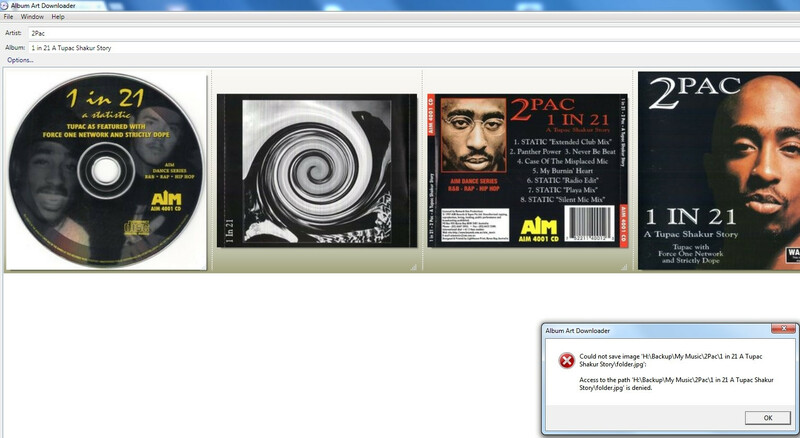 I do get Album Art Downloader has stopped working messages when I look for art, then it crashes! No messages. I have 5400 albums, and queue 50 at a time. As soon is the first two search windows pop up, I get the non-responding message. Even as your program is still getting art. Then if I dismiss the error message, AADL stops and disappears! That's what it should be doing by default, as Folder.jpg... where are you finding it puts the art? Unfortunately that error message is not very helpful! Windows ought to have logged more details, if you run the Event Viewer and check for an error with the source ".NET Runtime" for the time the crash occurred, there might be more useful information there. Otherwise, I can offer general advice in that having all the sources checked can result in a lot of work, and a lot of memory usage (if they all return lots of results) - it might be worth trying it with just a few good sources instead. Another thing you can do to cut down resource usage is in the Queue Manager window set the number of simultaneous search windows to 1 or 2 instead of 3. Of course if it's a specific album that's causing the crash, then that's a different matter! If that's the case, then let me know and we can try and figure out what's special about it. This release fixes the reported crash when clicking on a source with filtered out results, and improves the robustness of the folder browser when dealing with invalid paths (such as those that are too long). I have also brought all the scripts up to date. Thank you AlexVallat for all of your efforts. This is a great program thanks to you. I have been using it for years! System.IO.DirectoryNotFoundException: Could not find a part of the path 'C:\Users\HP\AppData\Local\AlbumArtDownloader\AlbumArt.exe_Url_ab4blq4r5vajyecsjktugtsqgadfd4lg\1.0.2.0\Scripts'. Edit: For what it's worth, copying the "Scripts" folder from the 1.0.1.0 directory to the 1.0.2.0 directory allowed it to run, but when it opens the only thing listed under Sources is Local Files. Further edit: Completely uninstalling, restarting, and reinstalling seems to have sorted it out. I apologize for neglecting to try that in the first place; I know better! Thanks for such a handy program! I'm using the Search Window from the File Browser (It's important !). I want to download the cover as cover.jpg. I have a preset and default set to cover. The "Images will be saved to" filed is greyed and set to "H:\Carcass\Swansong\Folder%preset%.%extension%". If I use the Search Windows directly, this field is editable, so I can correct it. OK, I manage to get it right. On lines 672 and 677.
which result in a Covercover.jpg file in the end. 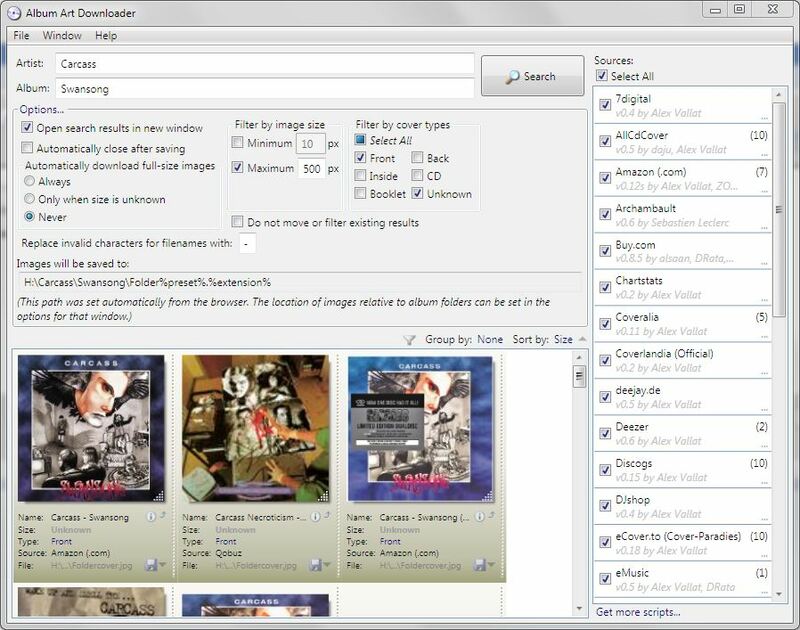 If you are coming from the file browser, then the image is saved in the same pattern as the file browser is searching for. So, to change this in the File Browser window, click the Options link and then in the Specify Path to Find Images change it to "Cover.%extension%". You don't need %preset% if you aren't using presets, and just want all your images to be called Cover.jpg. The preset system is there for doing things like "Cover-Alternative.jpg" or similar, when some covers need a slightly different name. I was looking in the top menu and I didn't see that options link ! 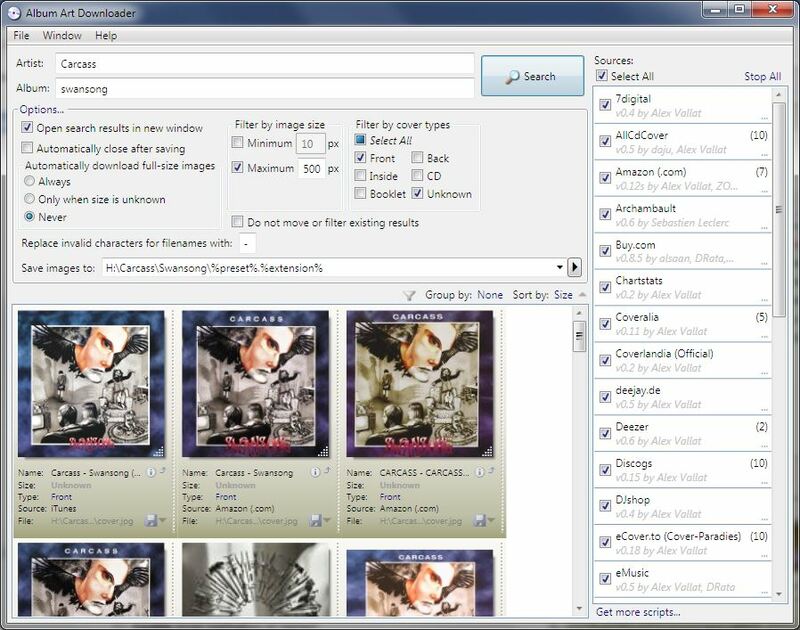 Hi, I've been using Album Art Downloader for a very long time, very good program! But now I'm having a problem, I'm getting absolutely no covers from Discogs and Google anymore (although having the newest 1.02.0 version). Is there maybe something broken in the scripts? I'm getting absolutely no covers from Discogs and Google anymore (although having the newest 1.02.0 version). Is there maybe something broken in the scripts? Thank you Alex for repairing Discogs!! But the loss of GoogleImages is very sad. For some older artists it is nearly the only source. Is there maybe a way to make a Bing or Yahoo script to replace Google?